This is a refurbished model of the original (v1) version of the Phantom 2 Quadcopter from DJI. It is a ready-to-fly (RTF) bundle that features a 5200 mAh flight battery lasting up to 22 minutes, a transmitter (hand-held radio controller) that is prebound to the aircraft, two sets of props, the landing gear, and a smart charger. Only basic assembly is required before you are ready to commence your first flight. It is crucial, however, to follow all pre-flight calibration steps to ensure correct operation of the flight control system. In addition to the normal RTF accessorizes, the GoPro Mounting Bracket is also included with this package. Able to act as an aerial platform for a GoPro camera when using the included GoPro mount or a separately available Zenmuse gimbal, this multi-rotor will appeal to a variety of potential users, from RC aircraft hobbyists who want to record their flights to videographers and photographers looking to open up a whole new range of shooting possibilities. Please note, this version of the Phantom 2 includes the original - shorter - landing gear. If you plan to use the Zenmuse H3-3D gimbal, the Extended Landing Gear will be required. 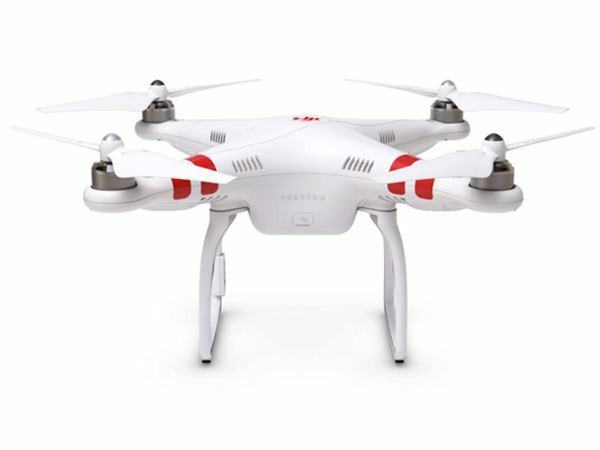 Included with this "ready-to-fly" version of the Phantom 2 Quadcopter is a 6-channel, 2.4GHz transmitter (TX) that comes pre-bound with the aircraft. It features an operational range extending up to 3,280' line-of-sight, depending on conditions. Because of the complexity associated with multi-rotor aircraft, the Naza-M V2 flight control system in the Phantom 2 relies on a GPS-based navigation as well as gimbal, compass, and other data to maintain flight stability and provide other assisted-flying features. While fully manual operation is possible, and can be unlocked using the Naza Assistant Software, most users, especially videographers hoping to get the smoothest possible shoots, will opt for GPS or GPS Attitude flight mode. In GPS Mode the Naza system keeps the Quadcopter stable and right-side-up when moving, and holds it in a fixed horizontal and vertical position whenever you release the sticks. The Phantom 2 features a 5200 mAh "smart" battery system that has been simplified compared to the LiPo batteries many RC aircraft use. The battery slots in without having to connect any DC leads, and features four LED indicators visible on the outside, tail-end of the aircraft helping you keep track of battery levels in flight. Charging is also simplified, with all of the charging circuitry built into the battery itself, there is no more separate balance lead to worry about plugging in. Because of this design, the Phantom 2 battery cannot be charged with all-purpose balance chargers, only chargers made specifically for it. Warning: Never use the DJI Phantom 2 Quadcopter with your GoPro camera when both devices have their Wi-Fi systems turned on. The DJI Phantom's Wi-Fi and the GoPro camera's Wi-Fi run on the same frequency, so if you use them together when both Wi-Fi systems are engaged, the DJI Phantom's transmitter will lose the ability to communicate with the DJI Phantom Quadcopter. Whenever this happens, you will not be able to tell the Phantom where to fly. This may result in loss of property or damage to your equipment. Minimal Assembly Required Those used to other RC aircraft will note the Phantom 2 requires only basic assembly using a screw driver and supplied wrench. You will just need to attach the rotors, skids, and a few other small parts. Once assembled you will need to be sure to follow all of the calibration steps to ensure correct operation of the GPS autopilot system before flying. Includes Transmitter (TX) The Phantom 2 features a 6-channel, 2.4GHz WI-Fi transmitter, with dual joystick controls similar to the kind found on other multi-rotor RC aircraft transmitters. The sticks are configured in "Mode 2", the most popular mode in the U.S. The left stick controls throttle (up/down) and yaw (essentially rotation). And the right stick controls cyclic motion (side-to-side tilt pressing right/left and tilting the nose up or down pressing up/down). A switch on the top right lets you choose between Attitude and GPS flight modes and a similar switch on the left lets you select between IOC modes. Naza-M V2 Flight Control System The brains of the aircraft, the Phantom 2 uses the same Naza-M V2 flight control system as several other DJI models, including the original Phantom. The software ships preconfigured with two available flight modes, GPS Mode and GPS Attitude Mode. Additional modes and other custom configurations can be enabled using the Naza Assistant software, a Windows-only application available for free download from the DJI website. In addition, the software can offload flight data for diagnostic and teaching purposes and well as perform firmware updates. Attitude and GPS Flight Modes The Phantom 2 has two GPs-assisted flight modes for you to choose from. Of the two, GPS Mode is the most automatic. In GPS Mode the Quadcopter will stop as soon as you release the controls and stay hovering at a fixed horizontal and vertical position. This setting is the easiest to fly and is generally preferred for shooting video as the Quadcopter won't sway or drift because of light wind gusts. GPS Attitude Mode, or Attitude Mode, is a more manual flying mode in which the Phantom 2 does not try and maintain a fixed spatial position. When you release the controls it will continue to drift unless friction slows it down or you stop it. And in this mode it will be more likely to be blown around if there is any wind. This not a true manual mode, however, in that the GPS navigation system is still used to maintain flight stability and by the "return to home" feature in the event of signal loss. Return to Home Failsafe If the Quadcopter loses the signal from the controller for any reason the "return to home" feature will initialize. The aircraft will ascend to 60 feet then make a straight-line course back to the "home position" you will have defined during the GPS calibration process. Once there, it will safely descend to the ground and power itself off. Intelligent Orientation Control (IOC) IOC is designed to help make flying more intuitive. Nominally, the yaw control will allow the Quadcopter to rotate continuously, which can quickly become confusing if you lose track of which way is "front". Suddenly your controls can get mixed up, where pressing right causes the craft to move left and pressing forward causes it move backward. Intelligent Orientation Control prevents this from happening, keeping the "tail" of the Quadcopter pointed roughly toward the pilot at all times. To enable this feature you will need to use the Naza Assistant Software. Slot-In Battery with LED Status Indicators A 5200 mAh battery slots into the "tail" of the Phantom 2 and enables up to 22 minutes of flying time. It features and on/off switch and four LED charge indicators that are visible while flying so you can keep track of remaining flight time. For recharging, balance and power regulation is handled internally within the battery itself. You simply plug it into a wall outlet with the supplied power cord and you are good to go. LED Status Indicator LED status light on the rear struts of the Phantom 2 provide you with various feedback as well as warnings. Colors alternate between green, amber and red and can either be flashing or solid. These messages give you valuable information such as whether the GPS system is properly calibrated, warning you the battery is getting low or telling you the remote's signal is out of range. Self-Tightening Rotor The Phantom 2 features a rotor design that is new for this model. There is no longer a separate prop nut and the threading is designed to be self-tightening, so there is no danger of a loose prop coming off in flight. Box Dimensions (LxWxH) 14.8 x 13.2 x 8.7"